The Alec Tam designed, Hyperliner is an unlicensed Hot Wheels casting that is mostly known for its detachable body that comes off to reveal four seats surrounded by a roll-cage and a super engine. While the roll cage and the detachable body were removed for its 2014 X Games 5-Pack release, the casting still features a metal-body and plastic-base. Described by Alec Tam as a futuristic Japanese van that is highly customized for racing performance, this Hot Wheels car is also a good gravity track vehicle–it does lack weight though, even with its size. This particular release was the initial 2002 First Edition release. Highly-sought after as it was billed by collectors as the “next Volkswagen Drag Bus”, due to its boxy-shape, large wheels and huge rear-spoiler, demand eventually fizzled out and the release was easy to find. The Hyperliner has been sparingly used in the last 13 years with only 10 releases of the casting; with most of those coming as part of 5-packs. 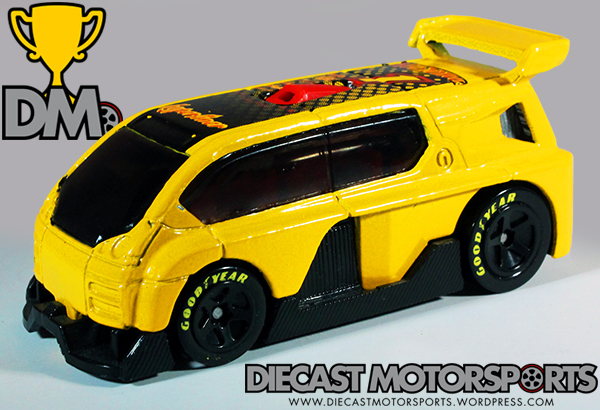 However, this futuristic racing van still continues to be released to this day–albeit without its detachable body. RELEASE DETAILS: Yellow Enamel Body (metal). Tinted Windows. Red & Gray Interior pieces. Black 5-Spoke Wheels w/ Goodyear Tampo. Black Base (plastic). Made in Malaysia. Toy# 52902. Released in 2002 as part of the 2002 First Editions.